Well, Easy!!! 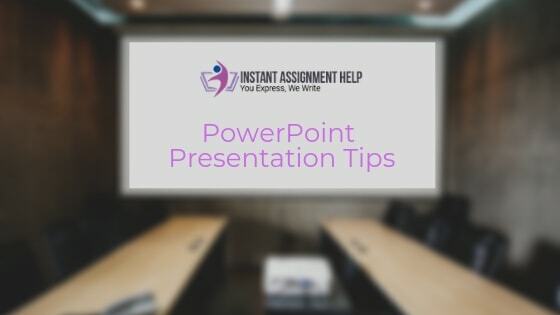 The experts at Instant Assignment Help Australia have been providing PowerPoint presentation making services for a long time and understand that how in need of perfect presentation sometimes students make it in a haphazard way. Here they have listed some important tips that they consider while making an interesting presentation. When you are given the task of preparing a PowerPoint presentation do not invest a lot of time in finding the designs. The free and paid custom designs are a great option. If you think it would make your presentation very general then you can play with the color scheme. Changing the color scheme is a great alternative to make your slides look different from your peers. Tip: The experts suggest, using free custom designs is an affordable option for the presentations that are to be submitted at university level. It is important that the layout of your slides are perfect. Use custom layouts to make the process easy and quick. The layouts have predefined spaces for text, images and more. All you need to do is decide your layout and get to work. Use master slide alternative if you have some changes that are to be introduced in all the content. Tip: According to the experts, using these built-in layouts would save a lot of your time. It would not require you to put individual boxes and waste your time in aligning them. Keep your text aligned for a professional looking presentation. No one would appreciate words and text randomly placed on the screen. Use alignment feature from the beginning to ensure that all your text is placed in a sober yet attractive way. Tips: Do not leave the alignment task for the end. Keep aligning your text from the beginning to ensure that the presentation eye pleasing and reflects the information clearly. We recommend that your presentation must not be very wordy. Do not try to put all the information in the slides. Just the main points and the sub headings would do. No one would like to read and listen the same stuff. It is advised you keep your content less, and visuals soothing for an impressive presentation. Tip: Less and well chosen simple words can help you deliver a perfect presentation as compared to a highly informative one. Last but not the least, add some interesting features to your documents. It is important that to make your presentations interesting you add some animations to it. Some movement on the screen helps break the monotony of the presentation and also keeps your audience engaged in your work. Tip: Use similar animation in the presentation to ensure that the presentation does not look clumsily prepared. You can add small videos to not only provide visual aid but also to help in making things interesting. A perfect PowerPoint presentation is prepared. Once you are done with preparing a perfect slide show, it is important that you practice it. It is suggested that the PowerPoint presentation that you have worked on will result only when it is delivered properly. So, Finally It Is All Done!!! If you think making presentation is going to take a lot of your time then you’re right. It would. If you want an interesting presentation being delivered to your inbox in no time, just reach to us and hire our experts to prepare an eye catching and intriguing presentation that can help you earn desired results.